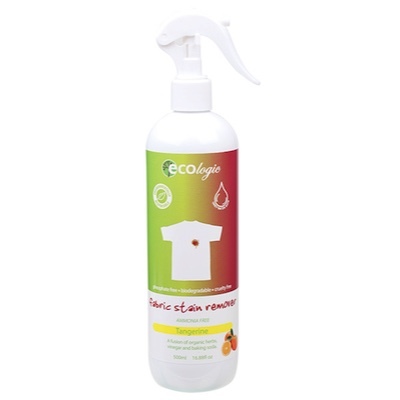 Ecologic cleaning - addition of a Fabric Stain Remover - (effective on Cuffs, Collars, everyday stains and on any type of white or colour fabric) With the cleansing strengths of Vinegar and backing soda! With the cleansing strengths of Vinegar and backing soda! Directions: Spray liberally and evenly directly to stains till they are well covered, let it soak a couple of minutes and wash as normal, washing machine or hand wash. For old stains, let it soak for approx. 5 to 10 minutes before washing as normal. White vinegar, bicarbonate of soda, organic tangerine essential oil, organic bitter orange extract.